This tutorial lets us create very basic ASP.NET Core 2 Web API using Visual Studio 2017. We will be creating Contacts API which let’s do popular CRUD operations. ASP.NET Web API is a framework that makes it easy to build HTTP services that reach a broad range of clients, including browsers and mobile devices. 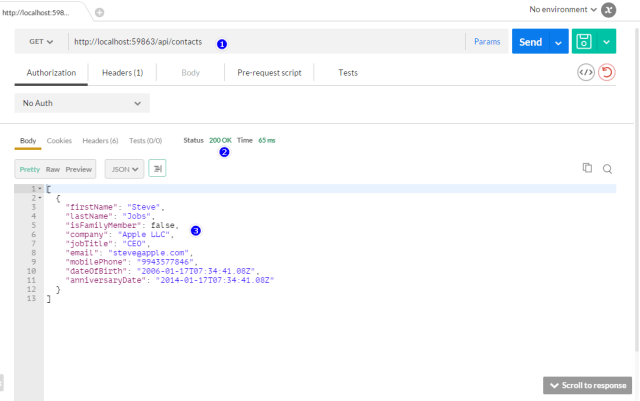 The Contacts API is very simple, basic Web API which does CRUD operations. I have focused on writing web API rather than integrating it with databases. Program.cs file is an entry point when application run, that’s right public static void main(). ASP.NET Core apps are considered as console apps. [Route(“api/[controller]”)] - this used attribute based routing to access the ASP.NET Core Web API. ContactsRepo is instantiated using dependency injection which we configure in services.cs. GetById fetches contact based on the mobile phone. Its given HttpGet with Name attribute so that we can use that in Create method to be used for location header. Create method after inserting contact, returns 201 response and provides location header. ASP.NET Core 2 Web API allows disabling of launching browser when we debug the application. Right click on “ContactsApi“, goto “Properties“ and Select Debug. You can uncheck “Launch URL“ check box to ensure it doesn’t the open browser (this is optional). RUN/ DEBUG application by clicking “IIS Express” which starts Web API, we can use other ways to start the application. Since Web API does CRUD operations on Contacts using in memory collections. 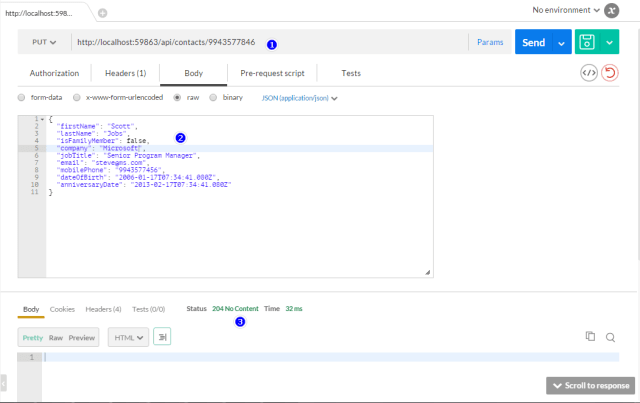 We will start with POST, GET, PUT, DELETE operations Using Chrome’s POSTMAN extension to test client, it’s very easy to use. Even Fiddler can also be used for testing. Point 2 provides location header which can be used fetch result. 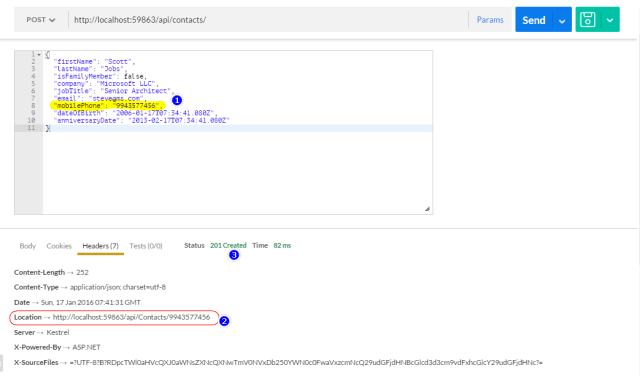 This sample will be made better by adding logging, connecting to the database using EF Core or EF 6 or any ORMs.